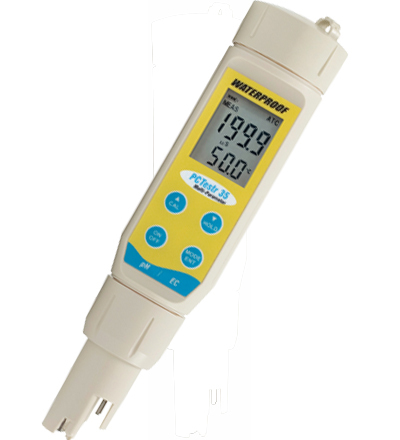 :: Full pH range measurement at up to 2-decimal places. :: Low, medium and high Conductivity ranges – tester measures pure water! :: Up to 5-point pH calibration and 3-point Conductivity calibration. :: Temperature sensor housed within unique dome-shaped casing for faster ATC response and faster measurements. :: Longest-lasting tester in the market! No tools required to replace sensor. :: "One-press Parameter Toggle": Switching parameters is just a press of the button. :: Certified IP67 Waterproof – Lightweight tester even floats for easy retrieval. Industrial: Use for cooling towers, food processing water testing and process/wastewater testing in metal finishing, photo development, printing and chemical industries. Educational: Useful in schools, many laboratory applications and ecology studies.